I have always been a collector. Growing up it was sports memorabilia. I even sold enough baseball cards to buy my first house! As a parking professional, I have a wide assortment of parking tchotchkes (Yiddish for collectibles). Every parking collector has a parking meter, but I have a variety of other stuff I’ll share in future posts, from ties to movies. I even joked I will put in my will to have the collection donated to IPI to display! All those collectibles are all relegated to my large (luckily) office. 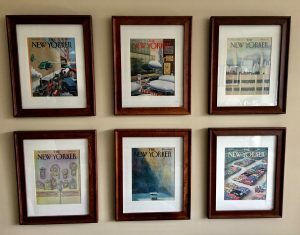 Shown here is a gift from my wife, who spends a lot of time on eBay looking for parking-related gifts, These are on display in my family room—nicely framed “New Yorker” covers highlighting parking-related themes. I have six but there are more. Enjoy. Larry Cohen, CAPP, is executive director of the Lancaster, Pa., Parking Authority.